My review: Caudalie-Vinoperfect radiance serum complexion correcting for a more even-toned and brighter skin complexion??? Hello, the past years have been the years of discovery for me regarding skin care. I think I finally find out what my skin needs and what type of products work for me during the year of 2012-2013. Today I want to talk about one of those products. Let's start with a little background on my skin. I have a combination dehydrated and sensitive skin that is prone to some break out and hyper pigmentation. I have two types of hyper pigmentation. One is caused by scars left by previous zits; problem that I am able to fix thanks to a product I have been using for a few years. The other issue comes from the fact that some areas of my face tend to be darker than others. I have an uneven skin complexion (don’t ask me why ???). 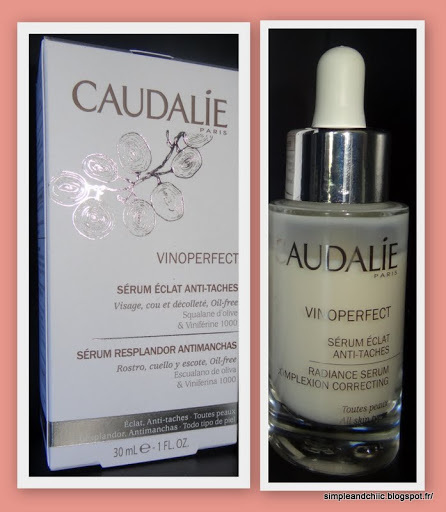 For years I have been looking for a product that will even out my skin tone, and for years I have not been able to find a product/technique that will do the job; not even 10% of it until I tried the Vinoperfect Radiance Serum from the brand Caudalie this summer. That’s a great discovery, and if you face the same skin issues you should definitely give it a try. Here is the link of the website for more information. What product have you been using for dark spots? It's now a big problem for me. Hi Diana, I want to tell you about a product and that I ran across and send you pictures of my progress before and after please look up UrbanRX if you want to see my progress reply back I’ll be glad to tell you how I came across the product and share my pictures.